The Daily Clog » Tuning fork causing escalator-clogging poop? Tuning fork causing escalator-clogging poop? 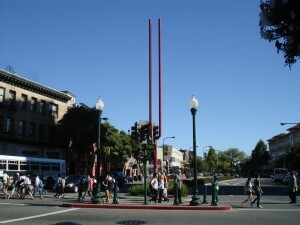 Spotted: an enormous tuning fork on Shattuck and Center — only recently did the Clog discover its true purpose. Yep, we thought it was just a mini field goal as well. But has this been the source of all our BART escalator-breaking poop? So basically the brown note, when played, is supposed to make you crap your pants. Follow our logic here: if the tuning fork is tuning to the pitches of the Earth … perhaps it’s striking the brown note … and thus inducing people to … poop on BART escalators. We know, it’s most likely improbable. Life would be oh-so-easy if a tuning fork were the cause of all our problems. Great issues altogether, you just gained a emblem new reader. What could you recommend in regards to your post that you simply made some days in the past? Any sure?